In one of the halls in Berlin’s Hamburger Bahnhof Museum there is a large architectural sculpture by the American artist, Bruce Nauman. 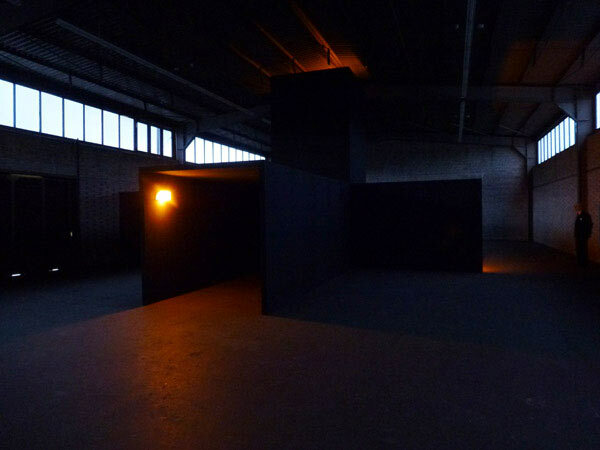 The hall that houses the work is so dark you can barely see the overall form when you first enter the space, then gradually, as your eyes adjust, you make out these dark steel corridors —three, square section, walk-through tunnels—that intersect over a metal grid in the floor. 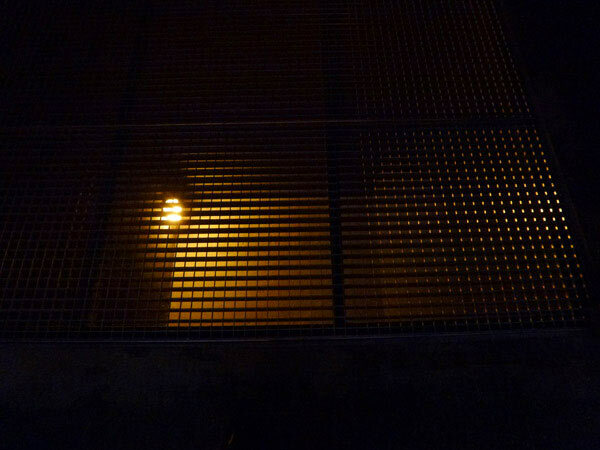 Below the grid, beneath your feet, is a cell, dimly lit by a weak bulb. This is Nauman’s dream-inspired and wonderfully titled, Room with My Soul Left Out, Room That Does Not Care. It’s unsettling and alienating and unsympathetic. It’s also mysteriously seductive. 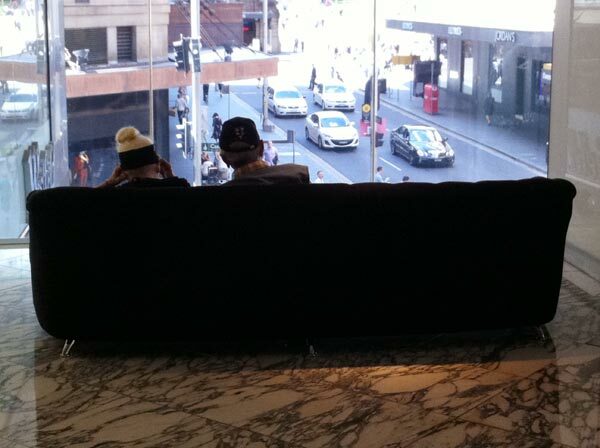 The interior of Westfield shopping centre in Sydney’s Market Street is also without a soul. It’s also alienating. But it’s not seductive. Not strangely soulless or beautiful-but-soulless or sexily alienating—like the cold beauty of abstract ideas or Nauman’s gloomy sculpture. These forms come with a gift of short term excitement, or longer term, they set up an interesting personal program for future fulfilment: ‘I know I find it alienating, but over time I can tell I’m going to learn to love it’, (and you do). Or like Room with My Soul Left Out, they disclose an acute connection between a place of desolation and your own circumstances: a connection you feel the need to contemplate further and, strangely, relish the idea of; feel weirdly enlightened by it. Not so with this interior. From the first viewing I understood that this one would never have those attractions and I will never be in love with it. The best place to feel the soullessness is on the escalator at the corner of Market and Castlereagh Streets. It reads, to me, as a signature sentiment (or non-sentiment) for the whole development’s public areas. Take the ride from street level to the top floor and see if you agree. At the top, look down. 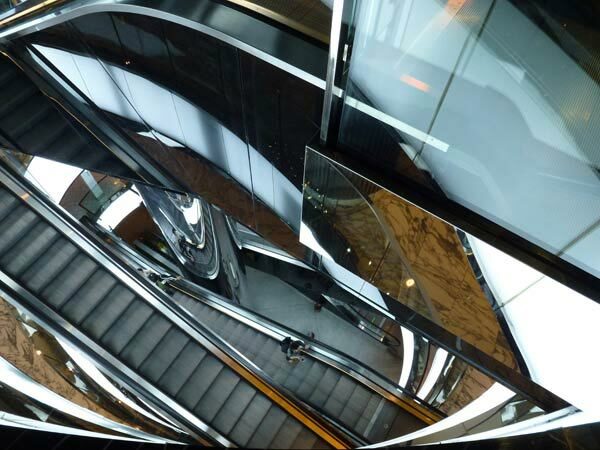 Almost every surface —except for the moving bits of the escalator itself—is clad in a silvery, mirror finished, metallic laminate. Surprisingly, instead of making the interior feel bright and open, the effect is dark and confining and all that dark shine has one more paradoxical effect: even though you are surrounded by multiple images of yourself it seems to lessen your presence. It’s impossible to walk through the space without seeing your reflection many times —in mirrored escalators, polished glass, metallic cladding, and the chrome-like strips that criss-cross the ceilings on each level—but rather than confirming your physicality, and your sense of ‘thereness’, all those depthless images of self have the opposite effect. It’s as if a rider on this escalator or a stroller in these corridors has less substance, is only a series of reflections lost in other reflections. The result is a relentless reconfirming of your insignificance. At first I interpreted this as a type of message. Certainly not one that consciously came from, say, a designer, a developer or an architectural client, but simply an unfortunate message by default, coming from the building itself—through combinations of form, materials and treatments and unintended combinations of effects. Buildings do speak. But I was wrong about this one. This building has little to say—and there is an explanation for this. Some buildings make people feel good: wanted, like people like to feel. Others plainly make you feel unwanted. Some introduce a type of malaise in the form of a hard-to-define rebuff, and initially, I thought that this was what Westfield was doing but I was mistaken. While Room with My Soul Left Out is a place that doesn’t care, Westfield is one that doesn’t know. Room has a palpable, uncomfortable, loaded silence. Westfield is merely dumb. Neither caring nor uncaring, Westfield provides little in terms of its own presence let alone being a confirmation of yours. Room may not care but at least someone or something is in there, an entity of possession perhaps, some lurking presence that at least doesn’t care, whereas all those shiny surfaces, all that grey light in those incessantly reflective and formless walkways says nothing and any voice I may have imagined to be coming from Westfield’s corridors was actually coming from myself. A proxy notion to make sense of its absence of presence. This is interesting: that a shiny shopping environment can have this effect. Even when I understand that in this place, the building itself is not the hero, but brand: the Westfield brand and all those fashion brands that accumulate under its roof. The public areas are, in style and function, merely an extension of the leased retail spaces and a characterless platform for brand. Brand in this place is a sort of saviour. Brand lives. Westfield may (unintentionally) diminish one’s sense of self and presence in its corridors or on its shiny escalators but it also provides (fully intentionally) the power of revival. Self can be restored because a material presence has been prepared for you, like the many mansions in God’s heavenly household, behind the gorgeous window displays of Prada, Miu Miu, Georg Jensen or Salvatore Ferragamo, or for those who may not be able to afford such full restorations, perhaps through a soul-nurturing Harlow Tote at Saba or the eye-comforting, elegant utility of a medicinal-brown bottle of stylishly labelled Resurrection Aromatique Hand Wash from the Aesop shop. The real allure is off-corridor, on the other side of the glass. These rooms ‘care’. I’m one of those walk-through people. The ones who frequently walk through but rarely spend. Apart from liking retail and fashion and being easily seduced by beautiful objects I can only guess at why I do this and speculate that others may do it for the same reason. As we pass each shop window we have a fleeting glimpse—a little vision of New Life—of what, for a price, our successful, made over self could be. The building says nothing. The brand promises everything. But that which is promised is never fully delivered and Life is only everlasting until the money runs out. Almost every day (weekends included) the same couple share this Westfield sofa near the Market Street skywalk and enjoy their view and crosswords. To Westfield’s credit, they haven’t been moved on.